As the dust tries to settle following Australia’s shock defeat to South Africa in the first Test at the Waca in Perth, the subject of spin dominated discussions in my neck of the woods. 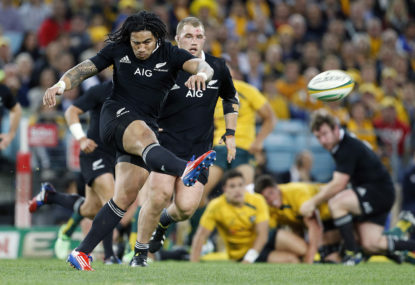 Many an All Black fan – and non-fans or neutrals – would have been excused for thinking Ma’a Nonu’s post-match comment on Saturday that “life goes on” was a rather nonchalant or dull response in light of his team’s achievement. After watching Scotland almost dispatch the Wallabies, I’m dispensing with a one-eyed approach and predicting that the semi-final cruncher between the All Blacks and Springboks at Twickenham on Saturday is, well, anyone’s game. That dreaded c-word spewed forth from some fans’ lips once again after Grant Elliott snuffed the life out of South Africa with a six into the long-on stand in the Cricket World Cup semi-final at Eden Park. So did the Proteas choke? Different generations spawn men and women of colossal status – it might not only be limited to sport. Is the Australian cricket side peaking too early? Great teams don’t happen overnight. The Australia cricket sides of the 1990s-early 200s under Steve Waugh and Ricky Ponting is evidence of it. The same applies to the all-conquering South Africa under Graeme Smith. Brendon McCullum’s innings of 302 at the Basin Reserve was a true spectacle, with fans of the attacking batsman surely sharing in his delight – especially after New Zealand took out the series 1-0 against a lacklustre India. Sixteen runs to win off three overs to achieve a world record Test target of 458 – with three wickets left in the hut. What would you do with history beckoning? While most in Aussie land hail their team for their Ashes form so far, I hope it wouldn’t be deemed inappropriate to look ahead to their upcoming tour to South Africa in February. SA do it for Mandela! When Simpiwe Vetyeka pummelled WBA super-champion Chris John into submission in Perth two Friday nights back, he set off a hat-trick of huge South African sporting achievements that tied in with the passing of their icon, Nelson Mandela, who was buried yesterday. Has the Aussie swagger made a timely return? It seems it had gone into Rip Van Winkle mode once the old guard hung up their boots. Whatever career Adam Gilchrist tries to pursue as a day job after retiring from all forms of cricket following a stint in the IPL, he should give dancing a shot. Assistant coach Russell Domingo has big shoes to fill when he takes over from Gary Kirsten as Proteas coach after the Champions Trophy in England and Wales. 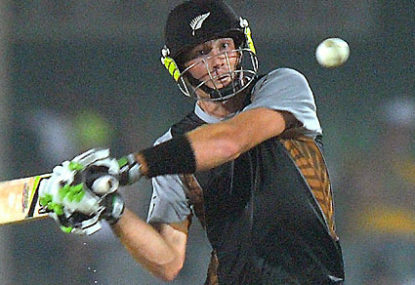 New Zealand’s Martin Guptill showed on Sunday at East London’s Buffalo Park against South Africa that, next to Chris Gayle, he remains one of the most explosive opening batsmen in limited overs cricket. The New Zealand Sevens team showed their dominance of the South African leg of the Sevens world series after winning their fourth consecutive World series Sevens title in Africa last weekend. The finger-pointing is rife after South Africa pulled off a miraculous win over New Zealand in a T20 decider in Auckland earlier this week. Where to from here, Australia? It’s obvious the main problem with Australia’s national cricket side is that they are struggling to play as a cohesive unit. New Zealand may have snatched victory from the jaws of defeat in the final of the Nelson Mandela Bay Sevens tournament in Port Elizabeth at the weekend, but their 31-26 victory over the Blitzbokke showed the South Africans are a team on the up. Where to now for Proteas? After South Africa had their egos deflated (once again) following their ousting from the ICC Twenty20 World Cup, it is the West Indies who may have to feel the full might of a Protea-backlash. I fear for the All Blacks in this year’s Tri-Nations campaign – not to mention next year’s World Cup – if they don’t get their act together sooner rather than later. 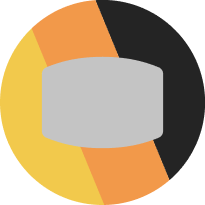 the all blac ks will be a much tougher proposition after their sa sojourn. just don’t think wallabies have a mental toughness on a par with their two counterparts in trinations. great as giteau and the new breed of youngsters are, together with sharpe and co. they still have a long way to go. there’s too much hyping up of the carter, giteau factor as brilliant as what they are you can only play when you have the ball. something tells me dan’s being rushed, sign of desperation perhaps? club match is different to trinations, dan knows that. just feel that he has become a target for over robust play due to his reputation. giteau”s going to need lots of help from his forwards to hold onto the ball, play in the opposition half for him to be effective. wallabies have gone soft, the all blacks just have their number. all blacks I think will win all matches down under. 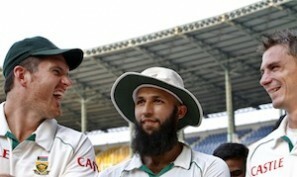 I agree Lee will find himself a spent force in Tests as Aussies now have something to build on. Cricket purists, having to put up with the erratic Akhtars and Harmisons of the world, it is always great for us to see Brett Lee steaming into the crease at full tilt, putting back the excitement into the art of fast bowling. An out an out quick, this guy always seemed to put 110 per cent into his bowling effort and should be applauded for that. Never mind the wicket-taking histrionics, we’ve seen far worse on a cricket field. 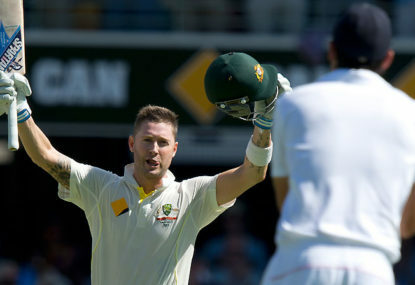 Lee could also wield the willow and he saved the Aussies’ blushes in many a Test innings. It’s funny to observe how when top Aussie cricketers seem to be on the wane, the extent to which they are criticised. 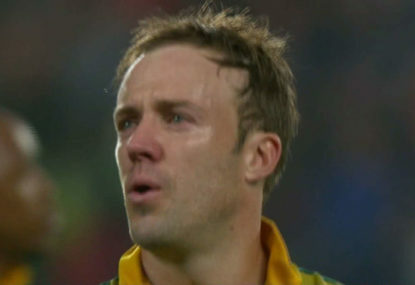 Many forget the contributions cricketers like Brett have made to the game of cricket. I think Brett put his body on the line with every delivery he bowled and probably didn’t get the number of Test wickets he deserved. More than 300 Test wickets takes some doing though. And though being part of at times abrasvie Aussie sides, Lee according to feedback is a good approachable bloke. At many Test venues he could apparently be seen signing autographs for the kids during breaks in play. A Test career on the wane indeed, but should the axe fall, I don’t think anyone can deny his total commitment to the art of fast bowling, as well as to Australia’s cause. I wonder if the same could be said of many of his fast-bowling counterparts in world cricket today. Yeah … I think Mitchell Johnson has paid the price for an Australian set-up that has overbowled their key bowler against the South Africans in the previous series. Just look at the number of overs he has bowled over the past few months. The stats may prove to be alarming. Pundits are constantly blaming a technical flaw in Johnson’s bowling that suddenly has become one of the reasons for his slump in form. His arm is too low they say. Fact is, Australia since the retirement of Glen McGrath, the Gillespie’s and others, has struggled to find a strike bowler, who can well put up his hand when the chips are down. Of course, they have Brett Lee in their armoury, but unfortunately he is once again on the sidelines, as seems to be the case as age becomes a factor. What the heck is Stuart Clarke sitting out for? Is he injured? 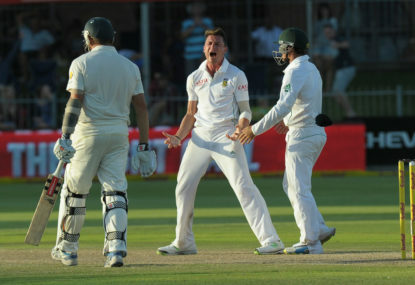 Peter Siddle puts it down hard and that worked in South Africa for him. However in England where wickets seem to be more susceptible to swing than bounce, Siddle could be found struggling. It seems blogger, Neil, who is wary of Proteas taking over number one ICC Test spot, actually presumes that the South Africans may well deserve that elusive number one placing. Imagine sitting on top of both the Test and ODI tables! And like hell, they may well deserve it as the most consistent team the past few seasons. Led by the in your face Graeme Smith, and a well-balanced team, who thrive on challenges – one could gauge from their success in Australia – and who have in their armoury out and out strike bowlers such as Dale Steyn, Morne Morkel, Makhaya Ntini and the ‘golden arm’ of Jacques Kallis at their disposal – and more than accomplished batsmen, could well run over both Ashes sides. England despite their talent, is coming off second best against South Africa these days. With Warne in their team, Australia had the psychological edge, and therefore it is pontificated the Aussies are battling to get twenty wickets in Tests. Nathan Hauritz has a lot of work to do in my opinion, one commentator labelled his bowling ‘a lot of meat pies’ Or as Geoff Boycott would put it, “dibbly-dobblers”. He needs to bring an ‘air of confidence’ and spin them out convincingly. Cricket fans of Australia and anybody else who is battling to understand the conundrum Aussie is faced with, seem to forget very easily what the Aussies have lost in terms of manpower over the past few seasons. People say it, but don’t really think properly about it. Players of the ilk of McGrath, Gilchrist, Martyn, Warne, Gillespie, and we go even further back to the Waugh era, cannot be replaced overnight. The problem is players like Warne probably come around once every generation – my, how time seems to have flown. 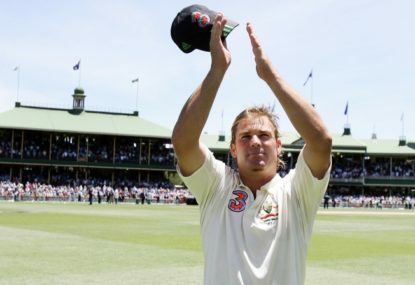 We who have witnessed arguably the greatest ever wrist spinner, not to mention cunning at that,should be thankful and honoured for having been able to watch him (Warne) at play. It may be that we are trying to match the present Australian side, with the ones that immediately preceded them. That won’t happen soon. 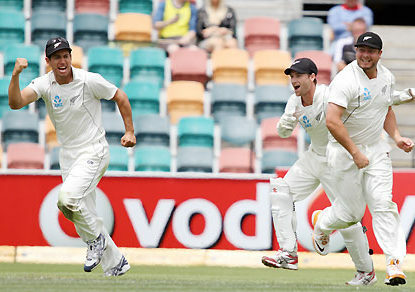 England seem to move up a gear when the Ashes comes around .. but they are a side with talent, but little to show for it. Really, when they have to shore up their team with South African born players it really begs the question: Where is England’s cricketing talent? Jonathan Trott is already 29-years-old. Golly, is there no younger players in England who coud step into the breach? With the number of South African born players on the county circuit, it won’t be long before we have half the English side comprising “SA-born players”. C’mon guys put some spike into the Ashes play. Hey BenJ … I don’t have to move to NZ to enjoy being a fan of the most admired rugby team on the rugby playing planet. You support who you want, and I’ll choose who I want to support as I am free to – when I last checked. Guess you know as well as I, why you are asking if I am from Mitchells Plain and assuming I am a Western Province supporter. Well, that is a slap in the face of all the Kiwi supporters who are spread far and wide in sunny South Africa, that means including outside of Cape Town, Did you think that the SA fan base of fanatical Kiwi supporters is limited to Cape Town only? 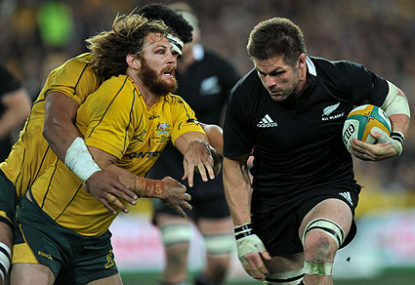 The All Blacks is an international brand, and they are admired by many rugby-loving people across the world. Just as Brazil is in soccer. Well I have news for you mate. I am from the Eastern Cape and love the Cheetahs for the brand of rugby they espouse. I’ll never back Province, neither the Sharks. But I respect these teams. And to make it clear, I do not detest the Springboks, as a rugby fan, I admire their play and they are indeed the best team in the world – well, at the moment that is. But I am a die-hard Kiwi fan as many of us are here in this neck of the woods. Many of us (who take the Blacks to heart) probably are more familiar with All Blacks history, than you are about your own Springboks (I take it you are a fan – right?). I’m not going to continue flogging a dead horse trying to explain my allegiance to the Blacks, I would probably need quite a few pages and many hours of explanation and to convince die-hard Springboks supporters whom I respect. And talking about identity problem, maybe that was true in the 60, 70’s, 80, and the early nineties as it was forced on some of US in South Africa, but thank goodness to democracy I don’t feel like a second class citizen anymore! Will someone please sack Graham Henry! I think Ivan’s missing the point. If you take a liking to a team, well you simply adopt them as a fan. There are many soccer fans I guess sitting in New Zealand as there are in many other parts of the world, who admire, and are fanatical about Brazil. Of course, supporting your country in sporting terms is a reflection of one’s patriotism. In my case as a South African, it’s not so much as I hate the Boks, I simply love the All Blacks. Remember up until 1994 with our first democratic elections – up until then as a 31 year old person ‘of colour I was not allowed to vote – it was extremely difficult, as it was for the majority of us to feel that sense of patriotism. For example, if I would go to an All Black match in the 70’s (and even into the eighties) in South Africa, I would have to sit on the stands reserved for ‘non-whites’ and would have taken a bus to the stadium where seats were also reserved based on the colour of one’s skin. Unfortunately I did not attend any AB matches on their tours to SA back then as a pre-teen, did attend provincial cricket matches in PE (to see the likes of Graeme POLLOCK) where I suffered the ignominy of having to sit in stands reserved for so-called “coloureds”. Even now many of the ‘older generation, still affected by the after-effects of an ‘inhumane’ system that marginalised the majority of its people back then, it is difficult to be patriotic. The All Blacks should know that thousands of people in South Africa today still pay wholehearted allegiance to the All Blacks. Many of whom identified even more with the players of Maori extraction. I took on the All Blacks as my team as a seven year old child, in 69-70. My father, as were many of his generation. was a huge supporter of the All Blacks that was also a ‘snub’ to the then apartheid regime. Of course, I was still an innocent child then, but when I was hoisted onto my dad’s shoulders to have a view of the All Blacks coming into the arrivals hall at Port Elizabeth Airport, who should my eyes fall on first. None other than the legendary Colin “Pinetree” Meads. There was an immediate connection as I ran towards him for an autograph. Now my dad is a huge Bok fan, but I wouldn’t budge as I am a big admirer of the All Blacks’ style of play, and I shall remain true to the team until the day I die. I remember watching in 1976 on television (yes tv had just arrived in SA then) Andy Leslie’s side to South Africa. Syd Going, Billy Bush, Bryan Williams – what more could a fan of running rugby want? Finally seeing your heroes live on television. Then the 80’s there were legends like ‘Cowboy Shaw’, Murray Mexted, Andy Dalton, Zinzan Brooke, Josh Kronfeld, and the list goes on. Of course we also loved seeing the Boks thrashed because this was a then-apartheid South Africa who marginalised talented sportsmen and women to eventually become the world’s sporting pariah. Now in modern SA many players of colour strutting their stuff on the international scene in cricket, rugby, soccer and others, have proven a point. Those before them (including their mums and dads) should never have been denied a chance to demonstrate their patriotism through their sporting talent. Now after that bit of history, let me emphasise I am not a Bok hater, just a huge All Black fan AND WILL ALWAYS BE! Yeah, how Deans must be smiling now … though he’s not that sort of person I would presume – to gloat over mishaps. In my book, he was definitely the man to take the reins at the Blacks. This man has the midas touch – can one and all not see the improvement in Australia’s play. To say nothing about his record at Canterbury Crusaders. Just like the current crop of All Blacks can’t seem to handle the ball, NZRU officials were unable to properly handle his obvious appointment to the position, that is now in the hands of a clueless Henry. But that’s the state of play at present. These guys just have to tweak their game and rise up to the occasion. And restore their’s and our confidence in the most exciting rugby-playing nation on the planet. There are two factors to consider in this modern age when it comes to the Springboks. I n my opinion It is very difficult for any team at this point in time to win in South Africa. Look at their record over the last couple of seasons at home – it speaks for itself. I am South African and I know why I hold that view. Boy, do you have to play well and know the opposition tactics here, to come away with a win. And, secondly, I’m appalled to see how the opposition’s ill-discipline (also the case recently with the Lions) hands the Boks points on a tray. What is even more appalling is that often these indiscretions are right in front of the posts. In the Montgomery era, (he could land kicks over from every angle anyway) that was suicidal and boy, is Morne Steyn deadly accurate. In fact, Steyn I felt, was gifted the points at the weekend through purely slapdash play and no-brainers on behalf of the All Backs. DISCIPLINE, DISCIPLINE… guys and you have half the match won. Henry indeed has been shown up, but I’m sorry you cannot blame the coach when players continue to spill the ball, and are lacking in simple discipline on the field of play. Okay, lets see what happens now. The Boks now travel Down Under after being safely ensconced at home … Lets see how really good they are when they are playing away in the Tri-Nations. Interesting times indeed.